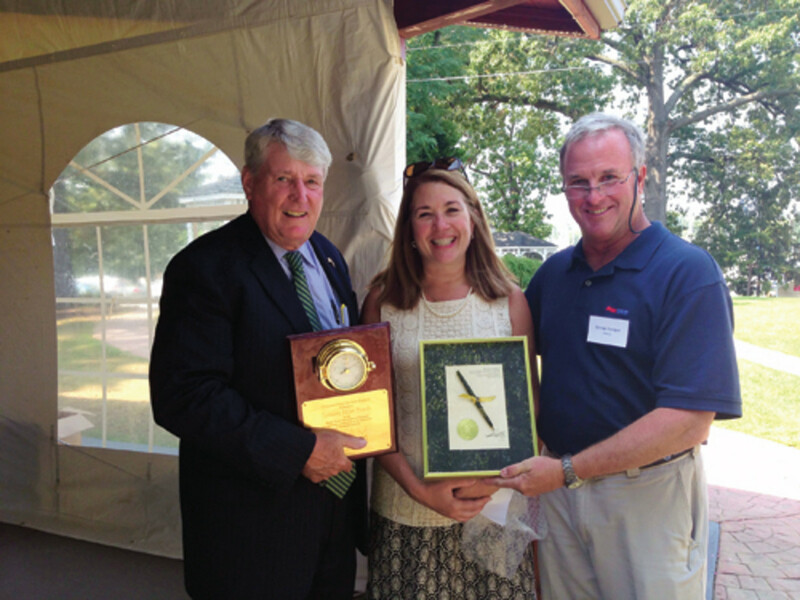 EDITOR’S NOTE: This report was written by associate editor Reagan Haynes, who presented data at the Marine Trades Association of Maryland’s September conference based on her July story on the aging of the boating population. That story served as the basis for the discussions. What do an acoustic jam, a vegetable garden and a keg of beer have in common? It sounds like the setup to an offbeat joke, but all were suggested as low-cost ways of boosting camaraderie among marina slip-holders and keeping customers happy (read: “loyal”). The discussion was part of the Marine Trades Association of Maryland’s September conference, which gathered about 100 local industry members in Annapolis to explore out-of-the-box ways to draw new demographics of boaters in an age that sees relatively few newcomers to the recreation. Nancy Bray of Hartge Yacht Harbor, Joe Pomerantz of Piney Narrows, Jed Dickman of Herrington Harbor Marinas, Don Reimers of Spring Cove Marina and Scott Tinkler of Port Annapolis Marina, where the event was held, launched a panel discussion aimed at brainstorming creative — and inexpensive — ways for marina owners to create their own atmosphere and keep customers loyal. Bray says simple things such as planting a vegetable garden and facilitating potlucks have been hugely popular and economical ways to foster a sense of community at Hartge Yacht Harbor. The focus of the conference was “The Scary Graying of the Industry,” based on a report that appeared in the July issue of Soundings Trade Only. MTAM executive director Susan Zellers says that as soon as she saw the article she decided to revamp the entire conference lineup. “This is something the whole industry needs to be thinking about today,” she says. American Boat and Yacht Council president John Adey talked to the group about boater statistics, cautioning that although industry data have been hopeful, other points of data tell a different story. Adey pointed to the 500,000 members of BoatUS, saying 91 percent are male, 56 is the median age, 96 percent own homes, and they have a $161,900 mean income and an average of 27 years of boating experience. Adey also addressed prevalent social trends among Generation Y, the Millennials. “I’m not interested in throwing everything I do up on the Internet,” Adey said. Because the digital natives are comfortable with that sort of collaboration and sharing, the industry should keep it in mind when selling them boats, products or the boating lifestyle. “Most of them are going to share their experiences online, whether it’s good or bad,” he says. Trade Only associate editor Reagan Haynes presented data gathered for the story and the creative ways several sources are addressing the issue. Since 1997, the age of the average new-boat buyer has increased from 45 to 53, according to Jack Ellis of Miami-based Info-Link. During the past 15 years the percentage of new-boat buyers under 40 has shrunk by half — from a third to 16 percent, Ellis says. The brokerage numbers are better, but not by much — a point that seemed to surprise some attendees. 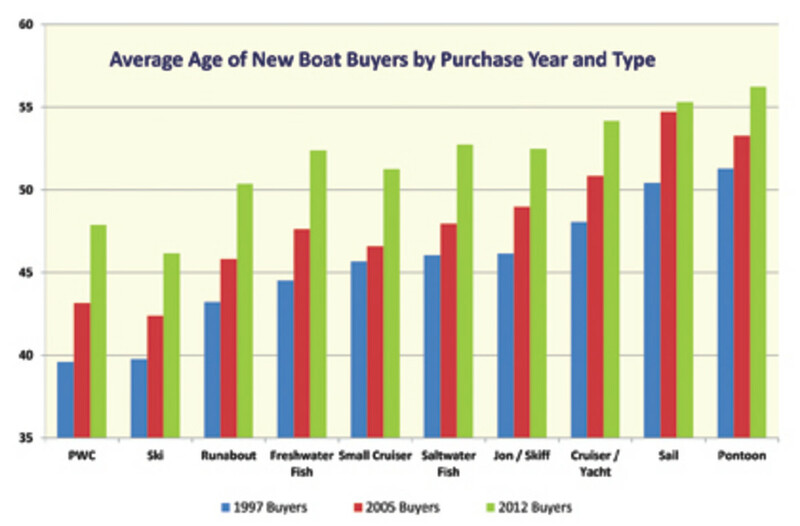 On average, used-boat buyers are roughly the same age as new-boat buyers back in 1997, according to Ellis. The increasing age of buyers is reflected in the types of boats being sold, Ellis says. For example, the recovery in pontoons has outpaced most other segments, but so has the age of pontoon buyers. The age of the average buyer of sailboats also has increased significantly since 1997. But business owners can look to creative moves others have made to reach new audiences. Bryant Boats president John Dorton recently partnered with a design college to task a class of Millennials who were students to come up with the next generation of boats. The student feedback showed that they favored minimalist, yet highly customizable designs. Kathleen Booth, CEO of Annapolis-based Quintain Marketing, gave a presentation about how drastically marketing has changed in the past few years with the rise of mobile technology and social media. It has led to a dramatic shift in the way consumers shop because they almost always do research on prospective purchases and know what they want prior to walking in the door. That means marinas and boatyards should generate online content that draws prospective customers to them instead of targeting people through traditional email blasts, mailers and advertisements. The trend is known as “inbound marketing,” and Booth said it is the “hot new thing.” To show up in people’s searches, she said, it is important to think as a first-time boater would. “You have to remember not to be too technical because the chances are, a first-time boater won’t know to ask about pumping stations for holding tanks,” Booth says. Providing general content on websites answering such questions can draw prospective buyers to businesses. Another focus of the conference was to discuss an ongoing effort that industry members hope will spur more local boat buyers to make purchases in Maryland. House of Delegates Speaker Michael Busch was on hand to accept an award for helping the Maryland General Assembly pass Senate Bill 90 in April. The law caps Maryland’s vessel excise tax at $15,000 a boat. For vessels under $300,000 the tax cap offers no benefit, but for boats above $300,000 the tax savings can be enormous. “Without Mike’s help it wouldn’t have gotten done, said MTAM president George Dunigan, who presented the award to Busch. Busch then presented Dunigan with the pen used to sign the bill, which was mounted in an inscribed shadow box. The contentious bill was the source of much debate among lawmakers and residents. Neither Delaware nor Rhode Island has a tax on boat sales, according to Gary Jobson, past president of US Sailing, who also advocated the cap, but did not attend the event. Virginia has long had a cap, enabling boat owners to pay no more than $2,000 in excise tax. Jobson, who was mentioned by Dunigan at the meeting for his efforts, maintains that Maryland’s disproportionately high tax drove boat buyers to neighboring states. In 2011, Maryland ranked 26th nationally in total value of boat sales, Jobson wrote in a Trade Only Today op-ed last March. “All of us who have ties to Maryland’s marine culture can tell stories of friends and neighbors who have boats based in other states,” Jobson says. Trade group legislative consultant John Stierhoff said at the MTAM meeting that the number of boats coming back to Maryland since the cap’s approval is being closely monitored. The conference wasn’t all business; attendees built small boats from Boy Scout-made kits and held a gutter race over cocktails. Racers “captained” their models through set-up gutters by blowing through a straw. True to racing form, participants maintained that one of the gutters presented a distinct slope advantage over the other.